A mother gorilla and her baby are doing fine in a British zoo after a very rare delivery by emergency cesarean surgery. The infant was born 11 days ago by surgical intervention after the mother showed signs of a potentially life-threatening illness. 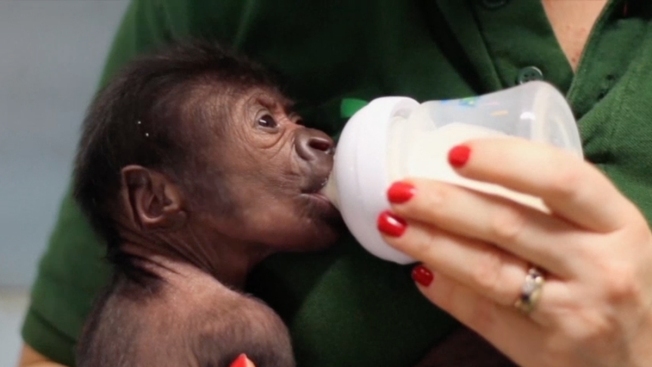 Bristol Zoo officials said Tuesday the as-yet unnamed female baby needed help breathing at first but is now doing well and being treated around-the-clock by experienced gorilla keepers. The baby's mother, Kera, is also recovering. The baby was delivered by Prof. David Cahill, a gynecologist experienced at delivering human babies by cesarean. It was the first time he had used the procedure to deliver a gorilla. He said there were signs the baby was unwell in her mother's uterus and needed to be delivered as quickly as possible.